Global money managers running both passive and active strategies saw passive assets grow faster than active strategies in 2017, against the backdrop of demographic and technological changes set to revamp the money management industry. Leading passive managers among that group offering both active and passive strategies grew 19.5% in 2017 to $19.89 trillion in assets under management, compared with the 15.6% AUM growth across the world's largest 500 money managers, the latest ranking by Pensions & Investments and the Willis Towers Watson Thinking Ahead Institute shows. The research on the world's 500 largest money managers showed total assets grew to $93.8 trillion in the year ended Dec. 31. Active strategies continued to dominate across the top 500 firms that offer both active and passive strategies, accounting for 77.6% of the total assets, or $72.8 trillion. However, active assets grew 16.9% from 2016, increasing at a slower pace compared to that group's passive assets, which grew 25% in the year. The leading passive money managers' growth in 2017 compared with a 9.9% increase in 2016. Over the past 10 years, passive managers among the top 20 have seen their total assets grow at a compound annual growth rate of 9.5%. For the overall 500 firms, the 10-year annual growth in assets was 3.1%, according to Bob Collie, head of research at the Thinking Ahead Institute in London. "There is no surprise there ... the extent to which (assets) have gone up was largely driven by the equity markets," Mr. Collie said. "There is a little bit more concentration in the biggest 20 managers as a proportion of the total. And there are more (assets) in passive. If you look at the year-on-year change these are not big, but when you look over 10 years both of these trends tend to be prolonged in that direction." Mr. Collie thinks the statistics are "disguising the big story" as the industry is set to face more significant changes resulting from technology interacting with other global trends like demographics and the growth of investment platforms. "Effects (of the interaction) haven't been seen yet," he said. "When you add them altogether, it seems to us the asset management industry is, at some point, poised for some sort of revamp," Mr. Collie said. But "it doesn't flip overnight; it's not going to be like the taxi industry, which can change very quickly," he said. "Asset management can't change very quickly." 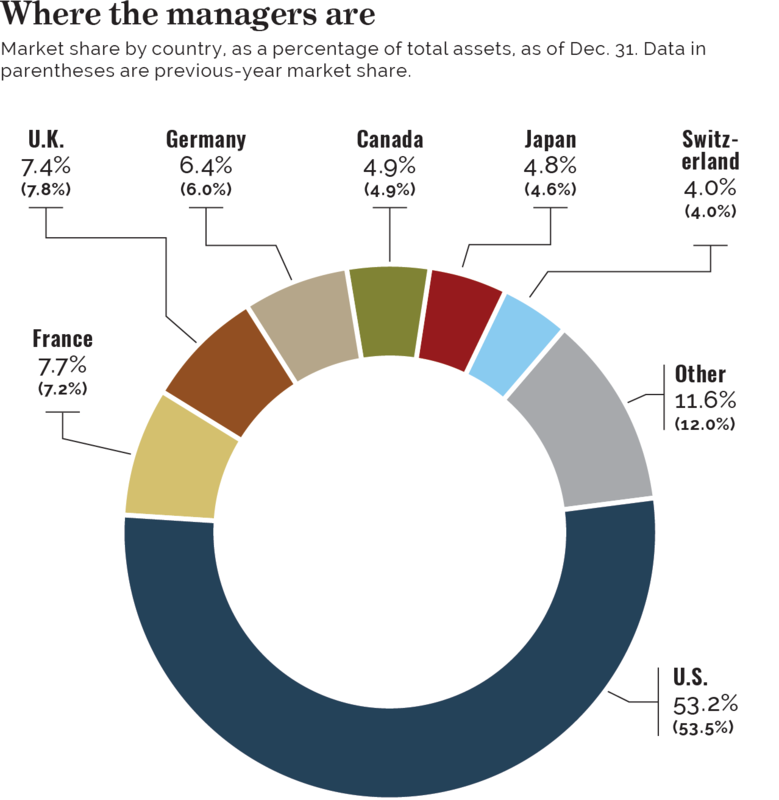 Among the top 500 firms, managers based in North America took a 58.1% share of total assets under management, with $54.5 trillion. That represented a 15.1% increase from 2016. Assets run by Europe-based managers, including the U.K., increased 15.8% to $29.9 trillion. U.K.-based firms alone saw their AUM increase 9.6% to $6.9 trillion in the 12-month period, Mr. Collie said. He added these increases can be attributed to global market growth. "Bonds are up and private markets are up, but the largest part of the market is equity," Mr. Collie added. "The other thing that was noticeable this year is that the U.S. concentration is just a currency effect," he said. The increasing strength of the dollar had a dampening effect on the growth rate in assets recorded by money managers in Australia, Canada, the eurozone and Japan, the research found. "Because U.S.-based managers tend to manage more (dollar-denominated) accounts, those assets will become larger (compared to the assets of other money managers) when the dollar moves up. Short-term variations in country concentration are driven by currency valuation movements," Mr. Collie said. On average, firms globally invested 46.3% in equity, 27.3% in fixed income, 15.8% in alternatives, 8.1% in other asset classes and 2.5% in cash. Equity assets grew 21.9% to $23.69 trillion, and fixed-income assets grew 14.5% to $16.6 trillion. Alternatives assets under management grew 16.6% in 2017 to $2.82 trillion. The 2017 research also showed assets allocated to factor-based strategies grew 14.5% in 2017 to $1.8 trillion. Environmental, social and governance investing strategies grew 10.7% in 2017, down from the 15.6% growth of 2016, Mr. Collie said. "It's hard to draw a hard conclusion from that number partly because people will mean very different things by ESG," he said, adding the attitudes and rate at which investors are moving toward sustainability is different in different regions. Along with the growth for the overall top 500 managers, the top 20 increased assets in 2017. Total assets under management for the 20 largest firms grew 18.3% to $40.6 trillion, and their share of the total pie grew to 43.3%, from 42.3% in 2016. BlackRock (BLK) Inc. (BLK) remained in first place, with $6.28 trillion in assets as of Dec. 31, 2017. The firm's AUM as of Sept. 30, 2018, was $6.4 trillion, according to its latest quarterly update. Vanguard Group Inc. remained in second place with $4.94 trillion in assets at year-end, and State Street Global Advisors held at third with $2.78 trillion in assets under management. Falling out of the top 10 money mangers was Goldman Sachs Group (GS), which was replaced by Amundi. The French manager came in 10th in the current ranking with $1.7 trillion in assets under management. In 2016, the firm placed 15th. Its ranking was bolstered by the completion of its acquisition of Pioneer Investments, which increased its AUM to €1.28 trillion ($1.48 trillion). At the other end of the listing, the managers ranked 251 to 500 saw their assets under management grow 10.5% to $5.28 trillion. Their share of total assets fell, to 5.6% from 5.9% in the 2016 ranking. Nearly 51% of managers surveyed said they had experienced a moderate rise and 30% said they had seen a significant increase in the level of client interest in sustainable investing and proxy voting. Some 56% said they moderately increased resources deployed to technology and big data. And 60% of the managers said they experienced an increase in the level of regulatory oversight. In other findings, the research showed U.S. asset owners represented the biggest client base for global money managers, accounting for 59.3% of their assets. However, European investors, excluding the U.K., grew as a share of clients to 15.1% from 13.9% year-over-year. Ranked by total assets under management, in millions, as of Dec. 31, 2017. For a printable version of this chart, click here. Notes: 1 As of March 31, 2017; 2 As of Feb. 28, 2018; 3 As of Oct. 31, 2017; 4 As of Nov. 12, 2017; 5 As of Sept. 30, 2017; 6 As of May 31, 2018; 7 As of June 30, 2017; 8 As of May 30, 2017; 9 As of March 31, 2018; 10 As of May 31, 2017; 11 As of Feb. 1, 2018; 12 As of April 30, 2017; 13 As of July 31, 2017; 14 As of March 29, 2018.